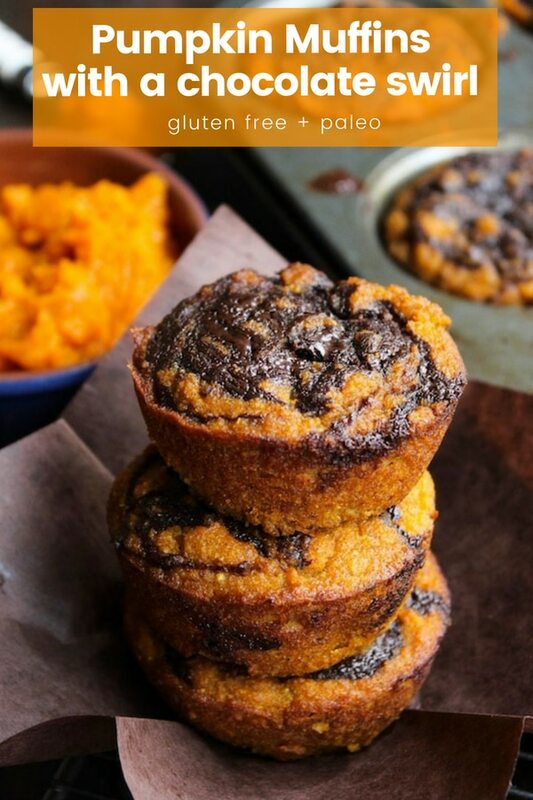 I thought I would help you start off your weekend with a tray full of this paleo pumpkin muffins! They’re soft, moist, and do I even need to tell you about that chocolatey swirl? Fridays calls for chocolatey swirls, yeah? As yesterday was the first official day of fall I felt it was necessary to share my first pumpkin recipe of the year. I am a total cliche. But I’m okay with that because I’m too busy making my kitchen smell like cinnamon apples, pumpkin spice and unicorns. 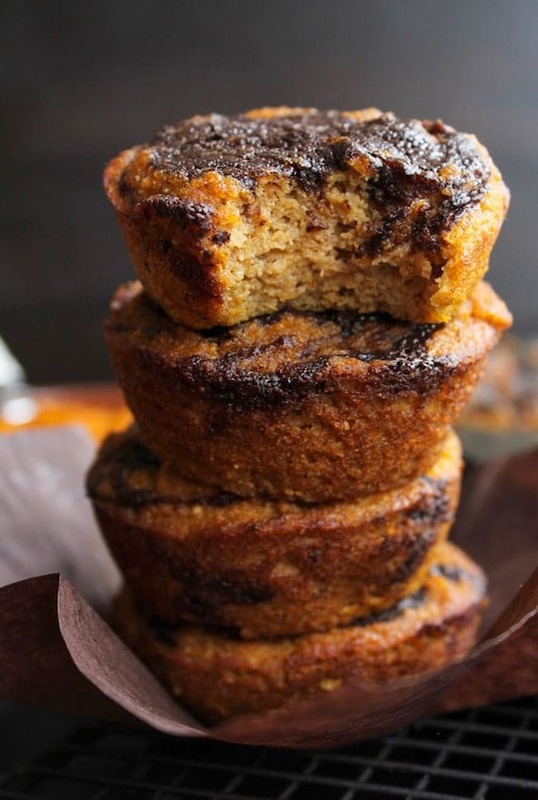 These paleo pumpkin muffins are a riff off of the pumpkin bread I shared with you last year. Since that recipe has gone over well I thought it was as good of an excuse as any to go back to play around with the recipe more. It’s a nut, dairy, grain and refined sugar free recipe – perfect for sharing, but also perfect for hoarding all to yourself. I wouldn’t blame you for the latter. What I love most about this recipe is how simple it is. They may look fussy with the swirly chocolate blobs, but it takes very little to no effort to throw together. Within about 30 minutes you’ll be pulling out a tray of these muffins out of the oven. All you need is one bowl to mix it all together and some chocolate for melting. Easy! 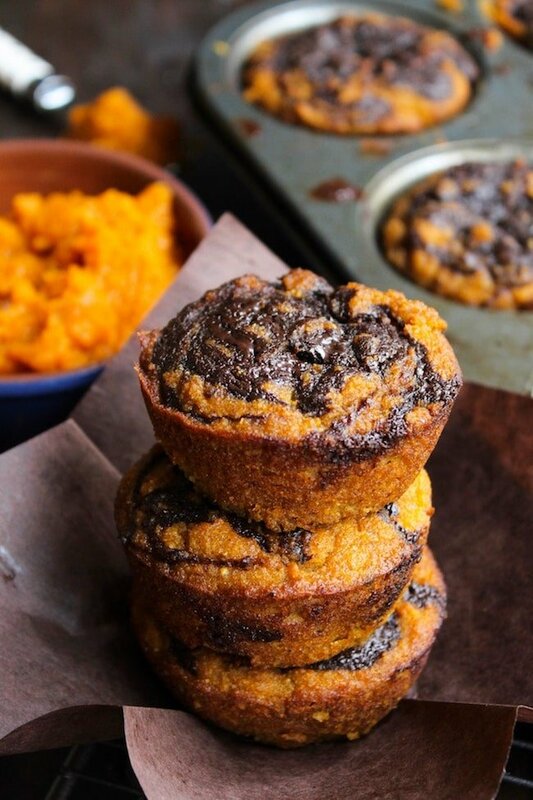 Don’t forget to #asaucykitchen on instagram if you try these paleo pumpkin muffins We love to see what you make with it! You can also post your pictures to my facebook page! These look so good! I want to make some for a mother-daughter brunch party I’m hosting for my daughter’s birthday this Saturday. My question is, do they freeze well? I’d like to make them as early in the week as possible and pop them in the freezer so I’m not rushing to get them done the night before her party. Hi Grace! That sounds fun! You shouldn’t have any problem freezing these – I make a batch every now and then specifically for freezing. So long as you let them cool completely they’ll be alright. I store them in a ziplock bag. You can let them thaw at room temperature over night. Hope you all enjoy them! I love love loved these!!! I am Gluten intolerant and love pumpkin so these make a wonderful snack for me. I have made them twice in 3 days. But their healthy right?? But anyway thank you so much for sharing and could you make this in a bread pan and make pumpkin chocolate bread? What would I change to make this. Thank you in advance. Hi Anna! So glad you like it! You can absolutely make this in a bread pan – it bakes at the same temperature just for 45-50 minutes instead. As for turning it into a chocolate version – that’s a little tricker. I haven’t actually tried any of these yet so I can’t say for sure. You could try adding 1/2 cup cocoa powder and only adding 1/4 cup coconut flour. You could also try keeping everything the same except adding 3 tablespoons cocoa powder and 100 grams melted chocolate chips to the batter. The second option I think would make for a much richer chocolate. I hope that helps and if you do try making it chocolate please let me know how it goes! I’m going to definitely be adding this to my list of recipes to make though so hopefully I’ll have a more fleshed out answer to you soon! I made these today cuz they got good reviews. I liked them and as others have said I will add more spice next time. I used the sugar free chocolate chips and pecans on top. Super recipe! Was wondering about adding (folding in )2 super beaten egg white at the end to make them fluffier. Thanks Cyndy! So glad you liked them! I’m not sure how much difference beaten egg whites would work. I was actually playing around with a new coconut flour based recipe today. I’m trying to make a paleo pumpkin roll and I thought I’d add beaten egg whites to make the cake part lighter and it really didn’t seem to do much. You could always try it out though – you might have better luck in this recipe! Love these but I can’t get them to not have a more gooey inside like a pumpkin pie texture – is that what it should feel/look like? What am I doing wrong and hopefully I didn’t just eat a bunch of uncooked muffins lol- if so, they were still sooo delicious. Hi Kristen! So glad you liked them! As for the insides – if you poke a tooth pick or a knife into the centre of a muffin does it come out clean or does it come out with the muffin on it? If it comes out clean then it’s cooked through otherwise it might need a little more baking. You may want to keep baking at a reduced temperature of about 325 until the insides are done. Hope that helps! So mine were the same, way gooey. Not cake like at all. Still delicious. But not the texture I perfer. I did use all egg whites though so that may be why. Also did not have pumpkin spice so I used nutmeg and cinnamon. Thanks for sharing your adaptations – those are always really helpful! Hey there, this is kind of a stupid question. I cook with coconut oil often but I’m new to baking with it. Do I melt first and then measure or is it half a cup solid? Thanks, they look great and I can’t wait to make them! Thanks! I prefer to use a scale so that’s perfect. Had all the ingredients on hand so it made this recipe really easy to make. I even cleaned the bowl with the wet batter. They were delicious. Next time I plan to incorporate crushed pistachios with the chocolate to give a little crunch. Ooh I love the sound of added pistachios! So glad you liked it! Thanks for coming back to leave a comment and review letting me know how it went! Sarah! These look great! About how long do they last and how did you store them? Needing good paleo snacks for a camping trip. Thanks Tiffany! These should last about 2-3 days at room temperature. To store them – wait for the muffins to cool down completely before putting them in an air tight container or bag and that should do it! Have fun on your camping trip! I would love to know the carb count. Made these last night and they are delicious! Any chance you could share with me what calculator you use? I made them with sugar free chocolate chips and yielded 10 muffins. Hi Sarah! I love these muffins! Thanks for the delicious recipe. 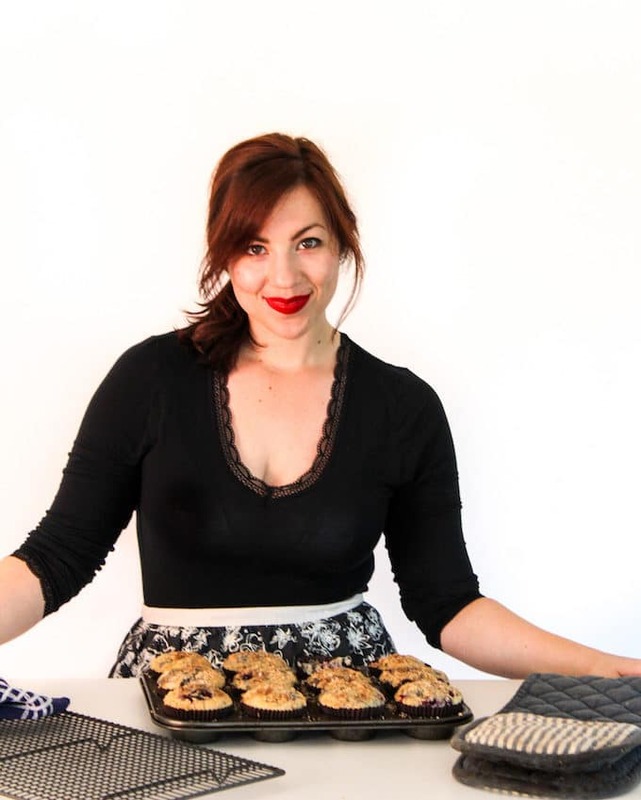 Would you mind sharing what food blogger forum you belong to? I’d love to check it out. Thanks so much! My girls and I really love these! Thanks so much for sharing! Can you use an egg substitute i.e applesauce, bananas or gelatin? Or possibly flax or chia egg? Hi Jessica! When it comes to recipes that use coconut flour, I don’t feel confident in suggesting egg substitutes because I haven’t played around much with anything other than eggs. I wish I could help here! Delicious! I took the easy route and just dumped in the chocolate chips but they are very tasty! Thanks Jennifer! Glad you liked them! j’ai réaliser les muffins un vrais régal, quant à l’huile de coco j’ai mis environ 25 cl. et cela à suffit. mon mari à adoré et moi aussi bien sûr. These are one of my most favorite Paleo treats! I sifted my coconut flour before adding it, which helps a lot to get rid of the clumps (I keep mine in the freezer). Thanks for a delicious recipe! That makes me so happy to hear! Thanks for coming back to leave a comment – they make my day! Good idea on sifting the coconut flour! Mine starts to get a bit clumpy after I’ve had it awhile. j’aimerai réaliser ces muffins, pouvez-vous me donner le poids exacte de huile de coco correspondant à 1/2 verre. Is there some other substitution you can use for coconut oil? Butter? Some other kind of oil? Does anyone know what the carb count is for these? Hi, Can I use gluten free flour in place of the coconut flour? Thanks! This recipe sounds really yummy, I love the combination of coconut, pumpkin and dark chocolate! I bet these are as delicious as they are beautiful! Besides, you 100% cannot go wrong with pumpkin & chocolate. Amen to that! Thanks Sarah! Wow, these look sooooo good and I can’t believe that they are Paleo! I would love to eat Paleo more often, so I am just going to have to try them! Thanks a bunch! Thanks Julianna! Hope you like them! These look fantastic! Can’t wait to give them a try. Have the ingredients assembled and ready, but is baking powder or soda needed? Powder is mentioned in ingredients and soda is mentioned in the instructions. Thanks for clarifying. Sorry Dorthy! It’s baking powder. Thanks for pointing that out to me – I’ll fix it now. Hope you like them! Thank you, Sarah! The muffins are tender and not too sweet and took about 30 minutes to bake for me. Looking forward to trying some of your other delicious-looking recipes! YAY for the start of pumpkin season! These muffins look like the absolute BOMB! The chocolate swirl makes them seem super difficult and hard to make, but I’m glad they are actually simple! 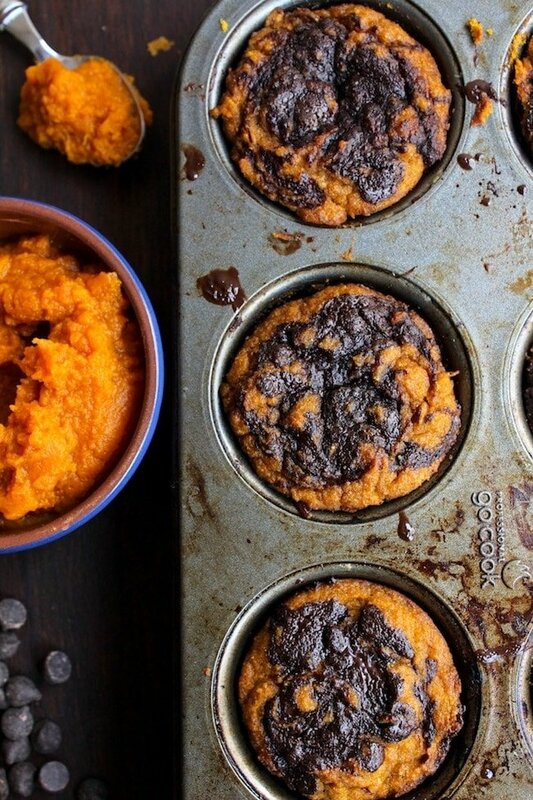 Chocolate + pumpkin is heavenly!